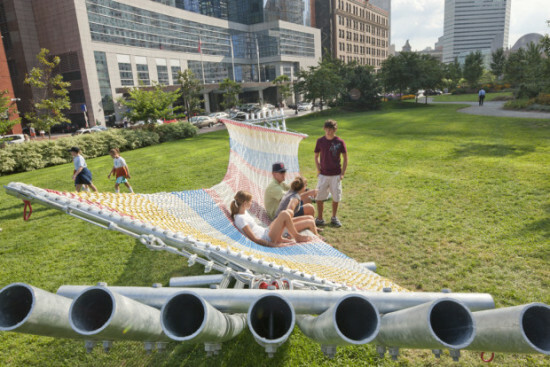 Hansy Better Barraza (Associate Professor, Architecture) is reinstalling the Big Hammock project in Boston. The Big Hammock is intended to serve the community as a simple lounge space as well as a sculptural expression. The Big Hammock created new ways to interact with and admire the urban and historical setting, complimenting the greenway as space of public leisure. Related fun-filled activities are planned on Saturdays during the month of August. A fundraising campaign has been launched to offset the cost of supplies and safety materials. RISD students are supporting the reinstallation of the arts project, along with a project dealing with immigration. The Tilt-Down Fence public art installation serves the local immigrant population residing in Dorchester, Mass. Both projects are spearheaded by Better’s non-profit organization, BR+A+CE, which strives to create radical community spaces through an interdisciplinary approach that brings together artists, designers, engineers, and community members.